Pictured: Steve and Kerrie at King David’s citadel in the Old City, Jerusalem. The past few weeks have had some faith building challenges, some great sadness and some unexpected miracles. From getting the news of the death of our good friend John Smith… the news that the turbo in our Isuzu Motorhome had blown up… delays in our ministry visa application to the USA and an incredible time with churches in Western Australia and work on the new trailer stage. Remarkably... I’m writing this from Jerusalem, Israel. 2019 is sure turning out to be a year of change. We’ve been dreaming about returning to Israel for years now. Then ‘out of the blue’ an invitation came from a Calvary Chapel fellowship in California asking us to help host a tour group for 10 days. To be honest…. We are blown away with gratitude for the opportunity!! It just happened to be at the same time as our 38th wedding anniversary and Kerrie’s birthday. We’ve had a few days to ourselves before the tour starts to be in Jerusalem, to walk the streets, enjoy traditional food and meet some very colourful Arabic and Israeli people. We are so thankful to the Lord for His provision and the sudden opportunities that come along!!!! Thanks again for your ongoing love and support. We’ve loved our trip to Israel so much we are praying about putting together a tour of Israel in 2020. If it is something that you have considered doing in your future please make contact and we will begin making plans for a 12 day tour of the most captivating little nation on the planet. Pictured: Last Sunday night in the Two Rivers Aboriginal church in Mooroopna Victoria. Matthew, Steve, George and our good mate Dave Graffin. Photo credit: Ian Bail. In recent weeks I’ve had the privilege to stand on the stages of the largest concert venues in Australia, before over 45,000 people. I’ve sung my songs in Darwin, Melbourne, Brisbane, Adelaide and Sydney serving the Graham Tour with Franklin Graham and artists from the USA. Trentan Kruger and I got to fly on planes and stay in motels and turn up at the backstage entrance of stadiums with ALL ACCESS tags around our necks. We got to take part in the morning prayer and Bible studies with the Billy Graham Evangelistic Association team. We got to do sound check with a world class production team and look out at the thousands of empty seats ready to be filled. It was an incredible experience. Watching as hundreds came forward in response to Franklin’s invitation every night and counsellors assisting in prayer and encouragement. And then when its all over…. Its back on the road doing what I’ve loved doing for 34 years. About 45 people turned up the the Two Rivers Aboriginal Church last Sunday night ready to lift the roof off with worship and praise!!! Pastor Joey Day welcomed us and the presence of the Holy Spirit filled the small historic church. Nearly everyone in the place came forward for prayer. People hungry for more of God’s love and grace in their lives. It was a great night of ministry. From big city stadium crusades to little country churches… the message never changes. What an honour it is to see people reconciled to the Father’s love through faith in Jesus. Never despise your day of small beginnings. Always be willing to go to the smallest of places to tell people they are important to God… Just as they are. It’s good to be back on the road and into 2019. So far.. this year has lots of open dates on the calendar but we always love seeing it fill up. There’s plenty of invitations to churches in the USA so I know there will be a few months of touring over there. Otherwise we have plans for more events in outback Australia, in Papua New Guinea and even the Solomon Islands. There’s opportunity for a new TV series, a book and plans for a 2020 national tour!!! Exciting visions and dreams ahead. 33 years ago Kerrie and I took a nervous leap of faith into the unknown realm called ‘full time ministry’. We knew we were called for more than settling for a predictable, comfortable life. We’ve made plenty of mistakes and taken a few wrong turns along the way. We’ve learned that even when you get off track God is still there and never stops loving you. When you start out on a new venture.. He is there… When you come to the end of yourself… He is there. He uses the very things that the world and the devil intend to destroy you with to define you. The God of all creation delights in using people like you and me to represent His eternal kingdom. He makes everything beautiful in its time and enables you to accomplish great things despite your lack of faith or inabilities. Don’t wait till you are ‘qualified’ because you never will be. Don’t wait till you have it all together because you probably never will. Nobody else on this planet can be the best version of you, like you can be. So love God and love people like He does and get on with living for eternity!! Jesus came to earth to break the curse of death and sin. He made a way for us to live in an eternal relationship with God. He has good plans for us all and I believe we can trust Him for the road ahead!! Get out there and go for it!! Become a partner in the Eternity Truck vision. Pictured: Steve and the corrugated iron Lutheran mission church at Haasts Bluff in the western desert NT. The church was freshly painted, brilliant white with a glossy British 'racing green' concrete floor. Entry was forbidden except on Sunday’s so all meetings were held from the front porch with people huddled around campfires on the ground outside. Revival ‘Singalong’s’ would happen every night and go until the firewood ran out. The entire community attended with a desire to be free of the addiction to grog and gambling, and the ongoing conflicts between clan’s. The Gospel message and singing together became the common cause for peace and unity. And so it is with life… without the unconditional grace of God over our lives we seem to live in conflict…. striving to make it on our own and focus only on our selfish desires rather than the needs of others. We were not created to be greedy, we were born to give, to be generous with our lives. That’s where real faith and fulfilment come from. As we step into a brand new year may our hearts be fixed on matters that make people and make history. Thank you for your friendship and love. Pictured: Communities gather for a Singalong to celebrate Christmas in the Western Desert of the Northern Territory. The remote tribal communities of the Western Desert had it on their hearts to celebrate Christmas on the first weekend of December. They believe this month is the open door to forgiveness… The time when we remember that God loved the world so much that He gave His most precious gift to break the curse of death and payback. Payback is when you choose to live in hatred and unforgiveness towards those who have hurt you in the past. For Aboriginal peoples this age old curse has been passed on from generation to generation, causing people to live in fear and bitterness. It is only broken when the blood of your enemy has been shed on the ground… which then reignites retaliation and the curse goes on. When the Gospel of Jesus Christ first came to the ancient, nomadic peoples of the desert country his story changed everything. This man who came from God, the creator of all things lived a sinless life and was persecuted, despised and betrayed. He was beaten and hung on a criminal’s cross and took the spear of ‘payback’ in his side. He said "it is finished” as He forgave his enemies…. as His own blood was shed on the ground. He died and was buried and then God raised him up from the ground. He broke that curse forever and asks us to live by His new law of love and grace. He sent His Holy Spirit to help us. So for three days and nights the people gathered and sang songs, shared stories and read from the Bible. The meetings went till after midnight and nobody cared. They were celebrating the coming of forgiveness. Thank you Jesus. I greatly admire my Indigenous brothers and sisters. They know that the only answer is in the one who is able to keep you from falling. I see the joy in their faces despite the hardships of life in a complex modern world. Pictured: A vintage 1967 Peterbilt under consideration for the future Eternity Truck vision. The Apostle Paul sure knew how to connect with people. Just like Jesus… wherever he travelled he was relevant to the needs and culture of the local people. We have that same desire. Over the past 33 years we’ve done our best to present a simple Gospel message and encourage people living in rural and remote regions of Australia. God has miraculously provided great teams and the resources to tour the nation for every new season. We are now looking at the decade of 2020 - 2030 and asking the Lord how we can be even more effective… The theme of ‘Hope for hurting towns’ does not leave us. Many local churches in country towns cannot afford the huge budgets attached to major evangelistic events yet in their tough seasons is when they need to hear the ‘Good News’ most. Our prayer is to raise $250,000 and build a 'state of the art’ mobile events stage that can serve country towns across Australia with quality evangelistic events for the coming decade. We’d love to reach a million Australians with the Gospel using the Eternity Truck!!! Just good old fashioned, community based friendship evangelism that tells people they are important to God… right where they live! We envisage developing a regular TV program featuring the Eternity Truck as it travels to different locations of Australia…. similar the the popular TV series ‘Everytown Downunder’ which screens regularly on ACCTV and other networks globally. For those interested: The 1967 Peterbilt is a service truck at the moment and is equipped with a new 400 Cummins engine, a new 13 speed road ranger gearbox and brakes etc. It can be converted back to a truck / trailer combo. We reckon it would make a great flagship for the Eternity Truck vision. Pray with us! Thanks so much for your friendship and support. My father showed me a photograph of the young lady he fell in love with back in 1955-56. She was the cook in the kitchen at the Bible College he was attending in Sydney. Her enthusiasm and faith in God, her passion for life and missions was too much for the young man from a small country town in the central west of NSW. Not long after he completed his studies they married and trained to become missionaries. In early 1960 they embarked on an adventure serving Wycliffe Bible Translators in Papua New Guinea with two small children. My little brother Warwick was born there. In 1969 Mum developed a mystery illness and the Grace family were forced to return to Australia to seek medical advice. It took 7 years before doctors eventually diagnosed that she had been living with a brain tumour. Miraculously Mum survived the operation but it affected her quality of life in many ways. Despite her disability she lived every day full of faith and joy. She never lost her peace. She was an inspiration to many. In 1989 Mum went home to heaven and we have missed her ever since. Some of the songs on the new ETERNITY album are there in memory of my mother. Songs that bring assurance and hope that heaven is very real and through faith in Jesus we live with its promise. That’s the hope of heaven. The hope of seeing our loved ones again in God’s presence forever. 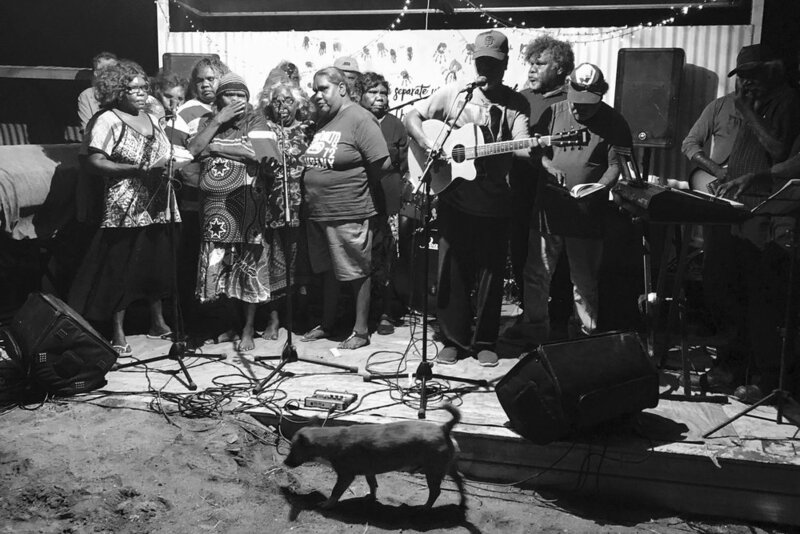 Other songs on the album were recorded at the request of elderly Aboriginal folks in remote communities who live with grief and sorrow constantly, yet never stop believing. I’m inspired by their love for the Lord and each other. Thank you again for your friendship and support. It’s been a humble journey to record and release this new album project. The support has come not from big business or big churches but from ordinary hard working people who believe in the vision. The generosity of farming families battling through drought inspires me to keep going with the mission to reach people for Christ and excite the local church in the task of evangelism. We honestly did not have the finances to do this new album and yet it will be available next week!!! Thank you for standing with us in prayer as it helps to ‘keep the ministry on the road’ for another fresh new season. The songs on this album will encourage many… especially those looking for hope in a time of loss. For those with unanswered questions of life and death and eternity. These are songs of faith for the tough times, songs about the promise of heaven. Thanks for your love and support.